Why does Thetford Marine/ Tecma only offer ID 38mm (1.5″) Hose? Tecma standard discharge connection is ID 38. More hose diameter will follow in the short term for potential alternative applications. When should I replace the sanitation hoses? That may depend. To check, you can rub the hose with a damp, clean cloth, then sniff the cloth. If it has picked up an odor, the hose is getting permeable and you will never eliminate the odor until you replace the hoses. Tecma HosePlus has an extreme low permeability with 5 year warranty. Could I use chemical detergents /deodorants in the hoses or they can get damaged? Just avoid using products such as vinegar, acetone, trichlorethylene. Avoid using solvents so as not to affect the rubber components. Moreover, avoid using gel and foams in order not to obstruct the vent valves. Do not dispose of harmful substances into the sea. What kind of hose connection is recommended? Any available marine fitting with the right ID connection. How long is the warranty regarding odor permeation for the HosePlus 38? 5 years (longest time in the market) thanks to the high quality butyl rubber with extreme low permeation. What are the warranty conditions for the HoseHelix 38? No extra-ordinary warranty period on PVC hoses. May I heat the hose to help it bend? Never heat a hose to make it bend tighter than it wants bend willingly. Tecma Hoses are already extremely flexible (see bending radius specifications) and shall not require much efforts to get installed. Does it make sense to replace only one sanitation hose line or shall I replace all at the same time? In case of replacement, it is highly recommended to replace all : Hose to pump out, hose to macerator, vent line, etc). Will the Bidet line of previous Flexi line be discontinued? Yes, but in addition there will be available perfect matching bidets for Silence Plus 2G, Silence Plus 2G Short, Elegance 2G and Elegance 2G Short. This will even further improve any bathroom design. How long will the older Flexi models remain available? Flexi line models (including Saninautico, Prestige, Bidet line (Bidet, Bidet Mini, Bidet Short) will be phased out as standard products during 2016- 2017. How long will the old Flexi Line spare parts remain available? Most Flexi Line spares remain valid as either still used on the Design Line models (e.g. discharge hoses) or compatible with new Flexi 2G line. Spare parts will remain available for 10 years. Do you have installation instructions that highlight the difference? Yes, the installation manual has recommendations about the new floor fixation system and syphon break installations. Is the new Flexi 2G floor fixation system compatible with previous Flexi Line models? No, the bracket floor fixation on the new Flexi 2G facilitates an easy installation of the new different designs. The kit used is in common with the already existing Design line. Do I have to make changes before installation in case of refit? The footprint is the same, so no change required (within ceramic production material tolerances). Do the new Flexi 2G line (Silence Plus 2G/Elegance 2G) internal hoses possibly fit with previously installed Flexi line? No. It’s not possible to replace them on the the old Flexi line models. What is the difference between the Flexi Line toilets and the 10 new Flexi 2G models? What remained the same between the Flexi and the new Flexi 2G models? Why should I use Aqua Rinse Plus? Thetford Aqua Rinse Plus combines performance with freshness. It enables a more effective flush and keeps the flush water clean. The intense lavender fragrance leaves a nice smell in the toilet and Aqua Rinse Plus leaves hygienic protective layer in the toilet bowl. How do I use Cassette Tank Cleaner? Cassette Tank Cleaner should be dosed and used according to the instructions on the label. An extra tip: warm water (max. 40 degrees C) will increase the cleaning action. What is the difference between your maintenance products and normal household products / non-Thetford products? Thetford toilets are made out of plastic and have several parts (seals, foams) which need special products to maintain. Our products are specially developed to guarantee safe cleaning of these specific parts and trouble-free and comfortable use of your portable or Cassette toilet for a long lifetime. Household cleaners may cause permanent damage to the seals and other toilet components. Where can I dump the waste from my toilet? Empty tank exclusively at a designated location at marinas and rinse thoroughly with clean water. What is the use of the push-button on the Waste-holding tank? Often a consumer is not aware of the use of the vent button. The vent button should be used while emptying the waste holding tank. To empty the tank without splashing, press and hold the vent button with your thumb while the pour out spout is pointing downwards. The toilet can be used with the blade open or closed. This is a personal choice of the user of the toilet. To open the blade, pull the blade handle as described in the user manual. Make sure that the blade is completely closed after use. How does the Porta Potti work? 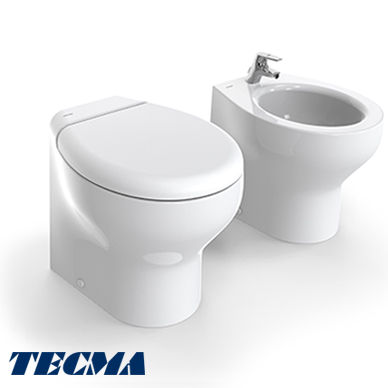 Toilet consists of 2 sections: the upper section is a combined flush water tank and toilet bowl with detachable seat and cover. The lower section is the waste-holding tank. See more details in product brochure, website or user manual. 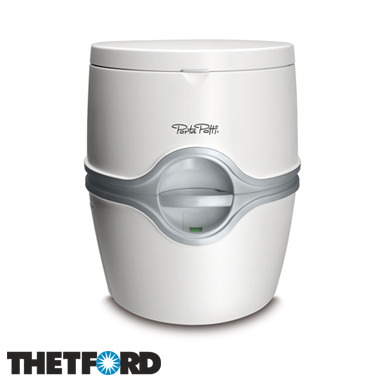 What is the difference between the Porta Potti 565 and Porta Potti 365/335? The Porta Potti 565 differs not only in its unique design from the Porta Potti 365/335, it also distinguishes itself with its new shape, seating height and unique features (e.g. toilet roll holder, integrated control panel, level indicator waste-holding tank and flush-water tank). Which spares are suggested on board? Normally a control panel and a pump are enough. Any case, keeping a kit of rubber hoses too will make it possible to reset a completely toilet. Inlet solenoid is normally a very reliable component. What kind of tube has to be used? Tecma macerator pump is able to discharge through any kind of tube (armovir, PVC, safe odor….). Check the diameter. Is it possible to flush into DN32, but this reduced section requires more power. Whenever is possible, use DN40. Is it possible to use acid or aggressive products for cleaning the toilet? Plastic and rubber components of the toilet have been tested with several commercial cleaning agents. Normally no problem has been found. Any case, products containing vinegar, acetone, trielina and generic solvents must be avoided, because they can make the rubber fragile. Avoid the usage of products in gel or in foam, because they could close the air vent tube. 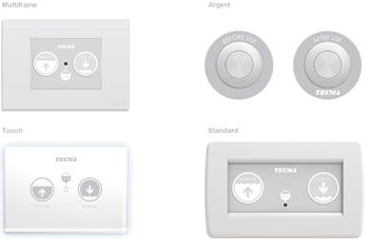 Tecma products do not need a specific maintenance or winterization. Any case, the usage of additives could be helpful (Thetford Tank Freshener) to maintain the discharge pipeline clean. This kind of product helps in avoiding odors and in flushing. It is safe for plastics and tubes. For inlet pump and solenoids, keep the strainers clean. Is it possible to connect more toilets to the same line? Yes. In this case a “Y” fitting is needed, in spite of “T” ones, to drive the flow to the tank. Always add a siphon break to prevent siphoning. Can’t find the answer to your question?